The foils of the SailGP F50 have been designed to delay cavitation for as long as possible - a phenomenon where the difference in pressure causes the water around the foil to boil, thereby reducing stability. The SailGP fan-centric, inshore racing takes place in some of the most iconic harbors around the globe and culminates with a $1 million winner-takes-all match race. Rival national teams from Australia, China, France, Great Britain, Japan and the United States battle it out in identical supercharged F50 catamarans, engineered for intense racing at electrifying speeds exceeding 50 knots (nearly 60 mph). 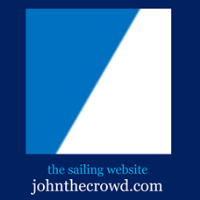 SailGP.com video above published Apr 5, 2019. Next stop on the SailGP tour: San Francisco, May 4-5.